Professor Jianfeng Jiang, associate professor of chemistry, recent published an article in Chemical Communication, an international chemical science journal. The article was co-authored by Jiang’s students, Tyler Berenson ’13YC, Nathaniel Tracer ’15YC, Daniel Shlian ’17YC, Michael Khaloo ’16YC, and Avraham Benhaim ’15YC. Titled “Oxidation of Carbon Monoxide in Basic Solution Catalyzed by Nickel Cyano Carbonyls at Ambient Condition and the Prototype of a CO-Powered Alkaline Fuel Cell,” their article was also featured as the inside cover of the journal. 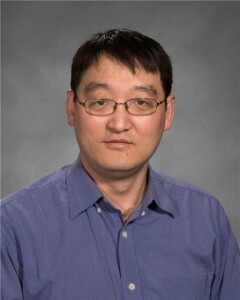 The article was part of a larger ongoing project funded by the National Science Foundation and led by Jiang, whose overall goal has been to find inexpensive, earth-abundant substances to serve as a reactors or “catalysts” which activate carbon monoxide and can be used as fuel sources with high efficiency and affordability. This paper describes how nickel-based compounds can serve as these catalysts for the oxidation of carbon monoxide. Using these catalysts, Jiang and his students built a prototype of a fuel cell, which can be used as an economical and efficient energy source. Generally, carbon monoxide is burned in big coal-fire generators to produce electricity. However, usually only 15-20% of the energy stored in coal’s carbon monoxide is actually being converted to electricity when burned. Jiang and his students’ fuel cell would be able to produce 60-80% and use a lower operating temperature, which means less money and less pollution. Jiang and his students will present their research at the Yeshiva University Undergraduate Academic Journal launch event,on May 5th, 2015.